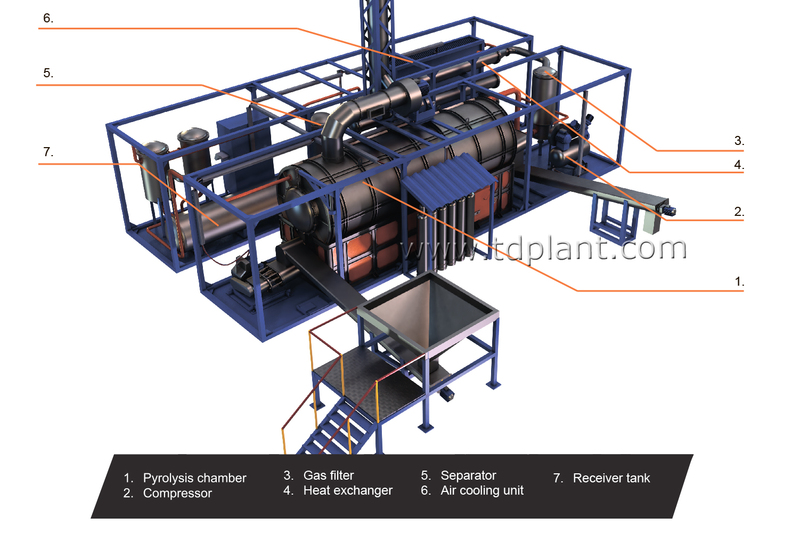 INTENDED USE: Pyrolytic thermal decomposition of hydrocarbon waste with the recovery of pyrolysis gas, liquid fuel, and dry residue (carbon black). — Fuel oil residue, lubricating and heavy oils. 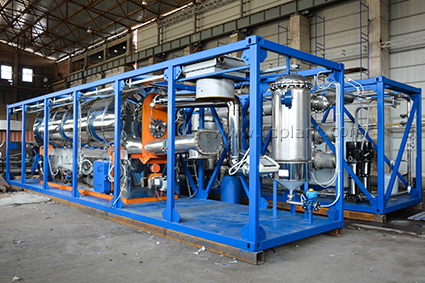 The process is based on low-temperature pyrolysis principle, involving the use of heat to thermally decompose hydrocarbon-based material in the condition of oxygen deficit. Paste and solid waste is fed by screw conveyor from the hopper. Liquid waste is fed from the receiver tank by the pump. 2. 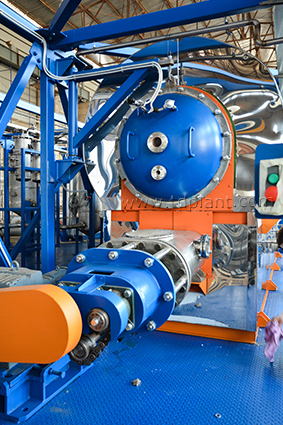 The pyrolysis chamber is heated to the operating temperature by the mixed fuel burner installed in furnace. 3. 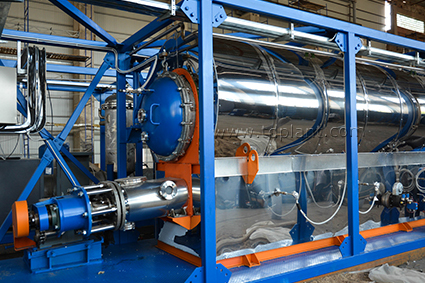 The pressure in the chamber is controlled by temperature rise rate. 4. 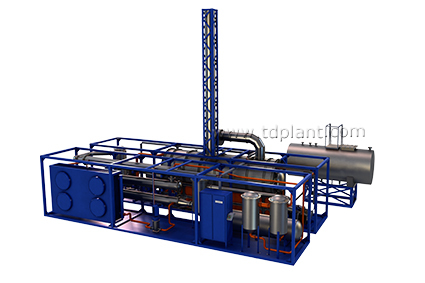 Boiler fuel or diesel oil is used for the plant startup. Fuel is self-fed from fuel tank to the burner. 6. 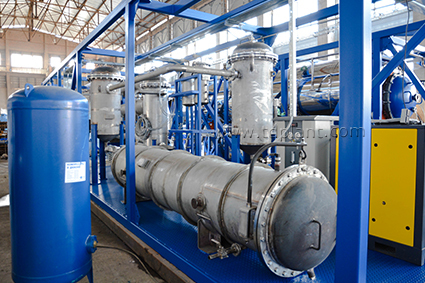 The beginning of the decomposition process is determined by the heat exchanger temperature rise to the set value. 7. 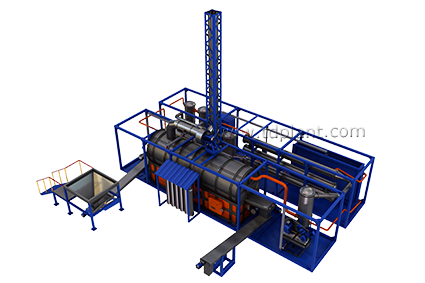 After process stabilizing the main burner capacity is lowered and heating is carried out by booster burners operating on pyrolysis gas. 8. Vapor and gas mix from pyrolysis chamber is fed to the condensation system through gas filter. 10. 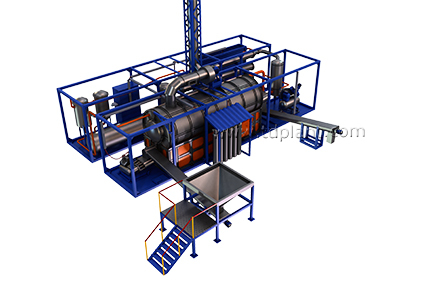 The further cooling of the mixture is carried out in the heat exchanger by recirculation. 11. 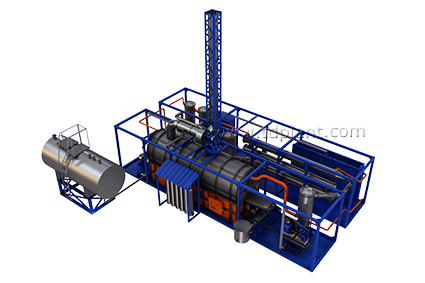 Water is cooled in air cooler or in chiller (depending on the operating conditions and feedstock composition). 12. Extension tank is installed in the line for the compensation of the volume fluctuations of chilled water. 13. Vapor-gas mix then enters separator where it is separated to liquid and gas phases. => LIQUID FUEL is drained to receiver tank and from there to the fuel tank or to the storage. => GAS is cleaned from sour components and is fed to the burners. 14. DRY RESIDUE is discharged by screw conveyor from the top of the reactor to the air tight hopper, where it cools and further to the storage bin, all the way without oxygen access.